This statistic shows the total population of Belgium from 2008 to 2018. In 2008, the total population of Belgium was around 10.7 million people. By 2018, the total population had increased by about 0.7 million people, leaving the total at approximately 11.4 million inhabitants. In the future, the population of Belgium is expected to increase even further. 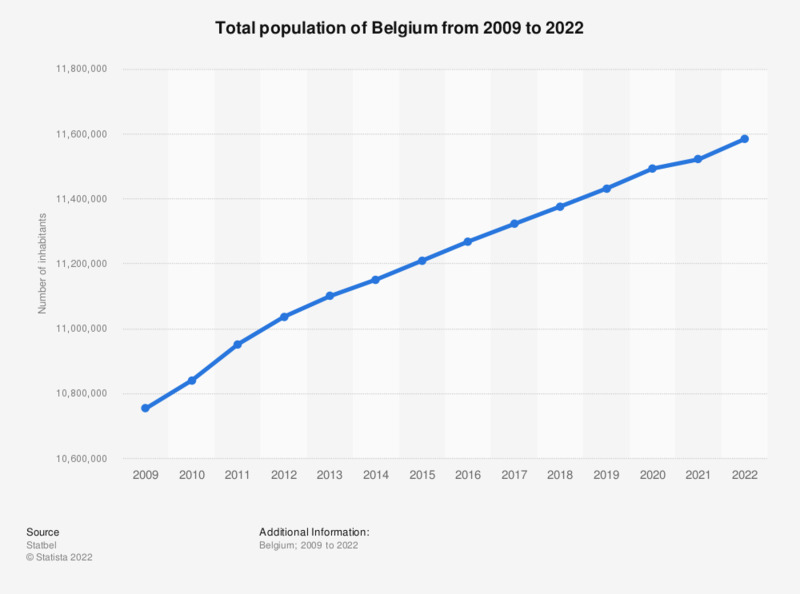 According to a recent forecast, the Belgian population will reach approximately 11.5 million people in 2020 and roughly 11.8 million people in 2025. The majority of the population today is between 18 and 64 years old, as can be seen here. The most recent numbers put the number of children and adolescents at approximately 2.2 million, the number of people between 18 and 64 years at roughly 6.6 million and the retired population of 65 years and older at approximately 1.8 million. Women outnumber men in Belgium today, as is visible in this graph. Everything On "Demographics of Belgium" in One Document: Edited and Divided into Handy Chapters. Including Detailed References. Statistics on "Demographics of Belgium"
How do you feel about marriage? How do you feel about divorce? Could you be happy without having children? What factors do you personally see as part of the good life? How do you feel about immigration of people from other EU Member States? How do you feel about immigration of people from outside the EU? To what extent do you agree with the statement: "immigrants contribute a lot to Belgium"?